The Netflix original series “13 Reasons Why” has been a popular topic of conversation among adolescents, teens, and their parents both in person and all over social media. The series has been praised by some for raising the issue of teenage suicide and providing a starting point for parents and children to have some important conversations. In contrast, it has been criticized by some mental health advocates and groups that it may glamorize “revenge suicide” and does not address the mental health component that is present in 90% of suicides. Individuals who choose to watch this show should do so with the full understanding that it is a work of fiction. Throughout the process, parents and adults should have open conversation and honest discussions with adolescents and teens about the realities of suicide and mental health. These discussions should not be limited to this series and should continue on a regular basis. If you or someone you know is in crisis or is feeling suicidal, contact the National Suicide Prevention Hotline 800-273-TALK (8255) . Trained counselors are available 24 hours a day to speak with and provide support. Free, 24/7 confidential support provided by trained volunteers. The Netflix original series “13 Reasons Why” has been a popular topic of conversation among adolescents, teens, and their parents all over social media since its premier on March 31. The show is based on the novel of the same name by Jay Asher, which tells the story of Clay Jenson and his experience in discovering why his friend and crush, Hannah Baker, ended her life by suicide. It is Minding Your Mind’s mission to provide educational programs that will spark conversations about mental health. It is our hope that within the dialogue taking place as a result of this program the message that nobody is alone and there is help available is one that people make a priority in these discussions. 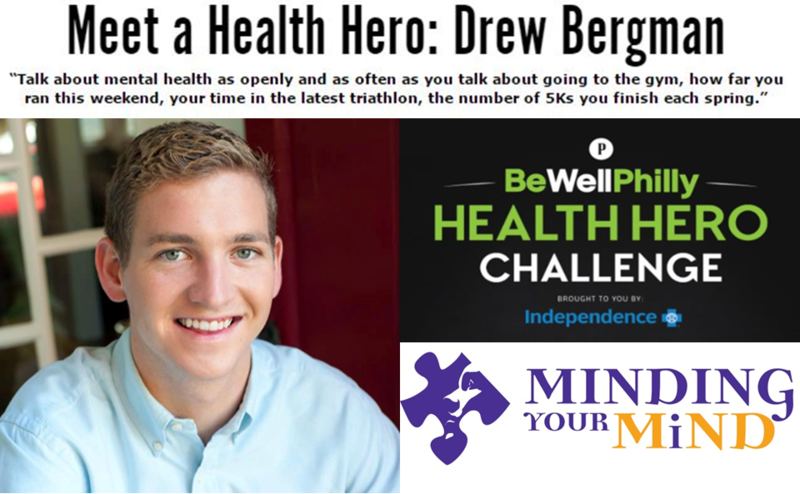 Minding Your Mind’s very own Drew Bergman is one of four finalists for the BeWellPhilly 2016 Health Hero challenge! He is the only finalist whose platform is directly related to mental health. If Drew wins this challenge, it will bring much-needed attention and awareness to the importance of making mental health as much of a priority as physical health. You can use this link to read about Drew, watch a video of him speaking about his advocacy, and vote from October 24 – November 7, once every 24 hours. We hope that you will consider taking the time to show your support of our amazing speaker and his mission to change the conversation around mental health. He already is a hero in our eyes – let’s make it official! After eight years of substantive and relevant work within New Hampshire and Massachusetts, the founders and board of directors of Keep Sound Minds (KSM) have made the decision to dissolve the foundation and end outreach and other efforts in the near future. Samaritans of Greater Boston: Samaritans has been providing compassionate suicide prevention programs for 40 years. Samaritans’ mission is to reduce the incidence of suicide by alleviating despair, isolation, distress and suicidal feelings among individuals in the Greater Boston community, 24 hours a day; to educate the public about suicide prevention; and to reduce the stigma associated with suicide. The Connor’s Climb Foundation: The mission of The Connor’s Climb Foundation (CCF) is to provide educational programs directed toward preventing suicide. It does this by raising awareness, reducing stigma, and equipping youth, educators, and communities with tools and resources focused on the vulnerable age group of 10-24 year olds. Treatment Advocacy Center: the Treatment Advocacy Center is a national nonprofit organization dedicated to eliminating barriers to the timely and effective treatment of severe mental illness. The organization promotes laws, policies, and practices for the delivery of psychiatric care and supports the development of innovative treatments for and research into the causes of severe and persistent psychiatric illnesses, such as schizophrenia and bipolar disorder. The KSM website and Facebook page will remain up and running for a short time, providing updates on programs provided by Minding Your Mind and the other organizations listed above. Ardmore, PA (October 18, 2016) — Minding Your Mind, an organization whose mission it is to provide mental health education that can break the silence and end the stigma and destructive behaviors associated with mental health issues, is bringing its highly-recognized set of programs to Massachusetts. 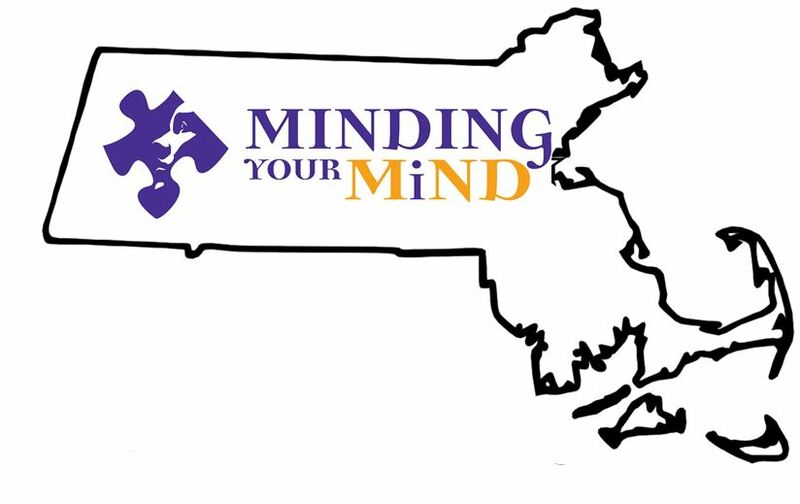 Through the generosity of the Jack Satter Foundation, and modeled after its highly-successful and established programs in the greater Philadelphia, New York, and New Jersey regions, Minding Your Mind plans to develop a significant presence and collaborative relationships in Massachusetts to improve the lives of adolescents, teens, and young adults. Of all its offerings, Minding Your Mind’s Speaker Program is the most popular and requested from schools and communities. The speakers – dynamic young adults who have struggled with mental health issues – visit schools and community groups to share their personal experiences and recovery. The presentations, which are free of charge to the host organization, occur during school assemblies, health classes, workshops, and evening sessions with parents. Issues that are addressed in these presentations include: mood disorders, suicide ideation, eating disorders, addictive behavior, self-harm, and bullying. Presented to hundreds of thousands of college, high school, and middle school students, the Speaker Program is an evidence-based contact strategy to reduce stigmatized attitudes about mental health issues. Through research conducted by the Scattergood Foundation, statistical analysis of the Speaker Program shows that the program is improving students’ attitudes about seeking mental health services. Minding Your Mind welcomes the public to an open community forum on Wednesday, November 16, at 7PM in the Newton Free Public Library in Newton, MA. Here, you will have the opportunity to hear from three of Minding Your Mind’s young adult speakers, as well as Ken Lambert of Keep Sound Minds, and meet staff members to discuss how your school or organization can benefit from Minding Your Mind programs. To register for this free event visit: mindingyourmind.org/events. In a poll conducted by Hope 4 Tomorrow, students were asked to respond to the following question: “Have you ever had thoughts of wanting to end your life?” Possible answers were: Yes, at some point; Maybe, but unsure if I wanted to die; No, Never. 53% said “Yes” or “Maybe”. This suggests the number of young people struggling is much higher than those who actually complete suicide. Minding Your Mind offers suicide prevention training for schools and communities. Please use the “Book A Speaker” link at the top of this page to schedule a program. 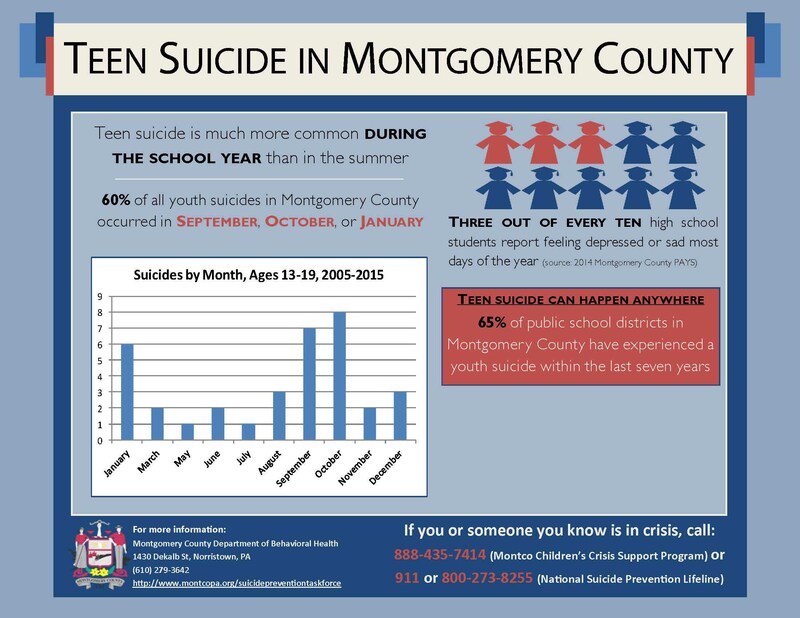 Data provided by the Montgomery County Suicide Statistics and Data Presentation, published June 2016.